Duomo di San Gennaro - Dedicated to Our Lady of the Assumption, even if commonly to San Gennaro, the Cathedral was built by Charles II of Anjou towards the end of the 13th century on the ground, where the Church of S. Stefania used to stand, near the Basilica di S. Restituta. The Duomo was re-arranged various times. 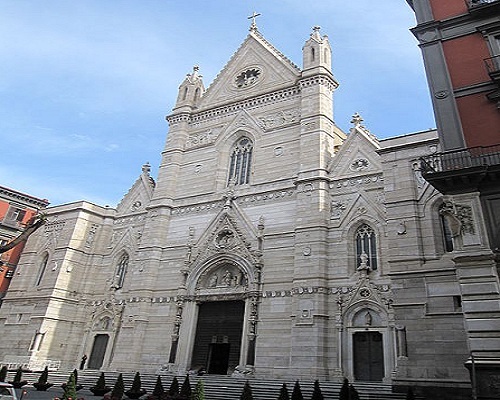 The façade was restored with its current pseudo-gothic shapes by E. Alvino and later modified by Pisanti. It preserves three portals of the original construction: on the middle one, rich in sculptures, La Madonna col Bambino by Tino da Camaino and the column-bearing lions of Nicola Pisano’s school. The Latin cross interior has three naves: the middle on, covered by a palatial wooden ceiling, presents the paintings of L.Giordano. In the right nave there’s the Cappella di San Gennaro o del Tesoro (1608-37), built after the vow of the Neapolitans, made on the 13 January 1527( S.Gennaro’s feast) to avert the damages of the plague. The Greek cross Chapel with the elegant and bright cupola, full of art works, is considered a separate Church and it represents one of the greatest expressions of the 17th century style in Naples: it preserves the reliquary bust of S.Gennaro by Giulio Finelli, a Gothic sculpture masterpiece. The church houses a vial of the blood of Saint Januarius which is brought out twice a year, on the first Saturday in May and on 19 September, when the dried blood usually liquefies. If the blood fails to liquefy, then legend has it that disaster will befall Naples. The catacomb of S. Gennaro is composed of two layers that do not overlap. The original nucleus coagulated around the pre-existent “lower vestibule”, by expanding it between the late II and early III Century. After the III Century, new areas were developed, the “ambulacra” of the lower catacomb according to a pattern of extensive excavation and horizontal development. The upper catacomb knew different stages of development: its origin is in the ancient tomb named "the upper vestibule”, known mainly for its frescoes of the vault of the late II Century.